At exactly 05:10 SMS Konigsberg raises its battle ensigns in Zanzibar harbor and fires on the surprised light cruiser HMS Pegasus (Commander John Ingles), which is anchored broadside to and two hundred yards from the shore. While still four miles away Konigsberg fires ranging shots from the 105 mm guns on her port side. The first salvo passes beyond Pegasus. The second salvo falls short. Aim is corrected and the gun layers adjust their sights. This time the shells land on target – and searing yellow flames and smoke rise from the still motionless British cruiser. Despite the unexpected shock of the attack, however, Commander Ingles has already brought his ship’s company to Action Stations and, as Konigsberg’s third salvo screams across the harbor, the gallant little Pegasus fires back in reply. But it is a one-sided contest. The British ship, a worn out relic of the Victorian age dating back to 1896 and mounting only eight old-pattern 4-inch guns firing 25-pound shells, can only get off one salvo for every four loosed by Konigsberg. There can be only one result of this battle. After twenty minutes of relentless bombardment, the British vessel is a blackened hulk. In all Pegasus takes more than two hundred hits; thirty-eight of her crew including two officers are dead or dying, and fifty five are wounded; Konigsberg suffers no casualties. Admiral Thomas H M Jerram reports to London that he can do nothing about the news that Graf von Spee’s cruisers have been seen on 14 September off Samoa. All his available ships are taken up by the hunt for the Emden and by the need to protect the first troop convoy from Australia and New Zealand. Lieutenant Colin Landseer Mackenzie (Highland Light Infantry) is killed when he is shot in the head at age 21. 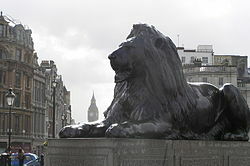 He is the grandnephew of ‘Sir’ Edwin Landseer the great animal painter whose best known works are the lions in London’s Trafalgar Square. He is also a cousin of Major General Douglas Scott. Major D’Arcy Wentworth Mander (Durham Light Infantry) is killed at age 51. He is related to General F D Mander and his brother will be killed engaged on Air Raid Precaution duty in the Second World War at age 71. Major William Stopford Sarsfield (Connaught Rangers) dies of wounds at age 46. He fought in the South African War. He is related to General Patrick Sarsfield and is the son-in-law of Percy Maynard DL. Major Alexander Wighton Ingles(West Yorkshire Regiment) is killed at age 45. He is the son of the Reverend Canon D Ingles Vicar of Whitham and Canon of St Albans and had served in the South African Campaign. Captain Henry Vivian Hare(Durham Light Infantry) is killed at age 33. He is the son of Admiral ‘the Honorable’ Richard Hare and grandson of the 2nd Earl of Listowel. He is also the son-in-law of ‘Sir’ Edward Hudson-Kinahan Baronet, whose sons will be killed in December 1915 and April 1916. Captain (Brigade Major) Dugald Stewart (Cameronians and 5th Infantry Brigade) is killed at age 32. He is the son-in-law of the Reverend I Harcourt-Vernon of South Africa and his brother was killed last month. Captain Eric Lea Priestley Edwards (East Yorkshire Regiment) is killed at age 36. He is the son of Lea Priestley Edwards JP and grandson of ‘Sir’ Henry Edwards Baronet CB and served in 1897-8 in Tirah. Lieutenant Aubrey Wells Hudson(Worcestershire Regiment) will die of wounds at age 31. His older brother will be killed in October 1916. Lieutenant Raymond Montgomerie Hume Henderson (Connaught Rangers) is killed at age 30. His brother will die of wounds in Egypt received next year on Gallipoli. Lieutenant Basil Claudius Ash (Sherwood Foresters) is killed at age 28. He is a Rosslyn Park rugby footballer. Lieutenant Patrick Maxwell Murray (Sherwood Foresters) is killed at age 24. He is related to Colonel ‘Sir” Wyndham Murray CB. Lieutenant Murray Robertson Sweet-Escott(Liverpool Regiment) is killed at Missy at age 26. He is the son of the Reverend Dr. Edward Herbert Sweet-Escott of Dulwich College and was the ADC to ‘Sir’ E B Sweet-Escott Governor and Commander in Chief Leeward Islands 1912-13. Lieutenant Kenneth Stanes Ruegg (Sherwood Foresters) is killed at age 24. He is the son of the Reverend Ferdinand Stanes Ruegg Rector of Wetherden. Lieutenant Geoffrey Russell Fenton (Connaught Rangers) is killed by a sniper at age 24. He is the son of William Russell Fenton DL and his father-in-law Lieutenant Colonel Ernest Henry Montresor was killed less than a week earlier. Lieutenant Allan William George Campbell (Coldstream Guards) dies of wounds received the previous day at age 39. In June he was accepted as the Unionist Candidate for the Doncaster Division of Yorkshire and he is the son-in-law of the 6th Marquess of Sligo. Lieutenant James Adam Hamilton Fergusson (Highland Light Infantry) is killed while attending a wounded man at age 22. He is the son of ‘Sir’ James Ranken Fergusson 2nd Baronet and his brother will be murdered by natives on his farm in Kenya in January 1953. Lieutenant Offley Charles Wycliffe Thompson (West Yorkshire Regiment) is killed in action at age 23. He is the son of Major General C W Thompson CB DSO. Lieutenant Cyril Cazalet Harrison (Worcestershire Regiment) is killed at age 23 when he is shot in the head. He is the grandson of Lieutenant General M W Willoughby. Lieutenant William Laurence Eliot (West Yorkshire Regiment) is killed at age 24. He is the first of three brothers who are killed in the Great War. Second Lieutenant Aubrey Hampden Barrington-Kennett (Oxford and Bucks Light Infantry) dies of wounds received from a shell at age 24. He is the first of three sons of His Majesties Body Guard who will be killed in the Great War. Second Lieutenant Gordon Alic Brodrick Birdwood (South Lancashire Regiment) is killed at age 18. He is the grandson of General Christopher Birdwood and his brother will be killed next June while a cousin will die on service in November. Second Lieutenant Evan Ronald Horatio Keirnan MacDonald (Highland Light Infantry) is killed when he is shot in the head at age 21. His brother was killed in the South African War. Second Lieutenant Harold William Roseveare(Wiltshire Regiment) dies of wounds at age 19. He is the son of the Reverend Richard Polgreen Roseveare Rector of St Paul’s Deptford and Rural Dean of Greenwich. His brother will be killed in November 1917. Second Lieutenant Robert Andrew De Stacpoole(Connaught Rangers) is killed by rifle fire at age 22. His brother will be killed in March 1915 and his nephew will be killed in 1944. They are sons of the 4th Duke and Duchess De Stacpoole JP. Company Quarter Master Sergeant William Joseph Woolger (East Surrey Regiment) is killed at age 31 less than one month after his brother was killed. Gunner Frederick Charles Challis (Royal Field Artillery) is killed at age 19. His brother will die in Mesopotamia in June 1916. Drummer Oliver Percy Holroyd Haines (Grenadier Guards) is killed at age 36. He is the son of the Reverend F W Haines. Private William Goodchild (East Yorkshire Regiment) is killed in action. His brother will also lose his life in the Great War. Emmanuel Iguinitz is killed at age 24. He played his only Rugby International match against England in April of this year. He is an artisan, jeweler and watchmaker.